: Benner tea is a brand of tea available at your local Aldi. I’m normally a fan of Aldi, good store wth inexpensive prices on a huge variety of groceries. When I moved to the states, it was the only place my parents shopped. Mad props to Aldi for helping us make it through those formative years. Unfortunately, the Benner tea brand falls apart because this Benner Green Tea with Orange, Passion Fruit, and Jasmine is pretty bad. The flavored green yea has a chalky almost cardboard-like taste, and the tea itself has a stale flavor. I suppose the one redeeming aspect is that the fruity portion is tolerable and does a good job masking the wackness until the aftertaste. Not a complete waste but I wouldn’t bother with it. 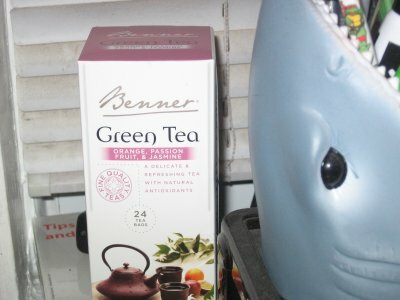 : Benner green tea with orange, passion fruit, and jasmine was a shocker staring at me in a Wisconsin Aldi. I’m used to seeing the likes of Grandessa mint tea or something else from the tea brand, but this newbie had to be investigated. A notable occurence was when I tore off the flavor-sealing plastic and BOOM, said flavor was unleashed, making my car smell like a wave flower power. As far as the taste goes, I have to say that it is pretty clean. It’s got a tinge of stale as hale in it, probably due to their infrastructure and shipping, but Benner passion fruit green tea is nice to work with. sorry I love this tea and have not been able to find it so sad! I love the Organge Passion Fruit and Jasmine Tea. I have stopped at all area Aldis in Michighan, Ohio , and Indiana to find it. I can’t find it. It is a same that this fine tasting tea is longer marketed in our area. This a terrible shame. Put this flavor of Benner tea back on the market. If it doesn’t sell, remove it. Let the market the testing grounds for this tea and not just a few negative comments. Let the market be the testing groundsfor this tea and not just a few negative comments. I love the Benner Green Tea Passion Fruit. Incredible delicious for a green tea and brews up with sugar and cream perfectly. what happened to the orange,passionfruit,&jasmine tea at Aldi? We loved it.It was the only one we liked. Is there any way we can get some? Please let me know.Thank you.